FOCUS ON ECUADOR - Our Adventure in Cuenca Ecuador Through My Lens! 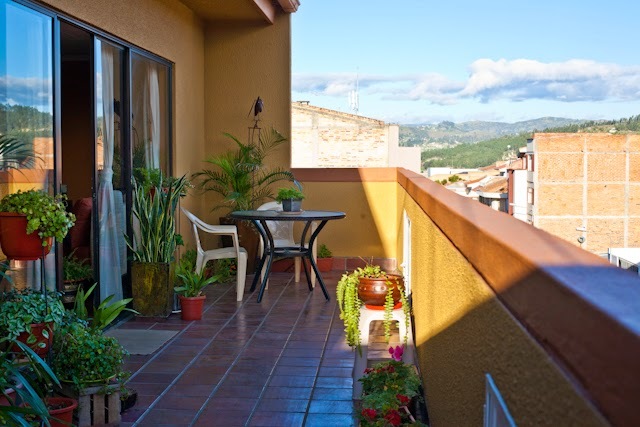 : RENTING IN CUENCA - WE MOVED AGAIN to Apartment #6!!!!! 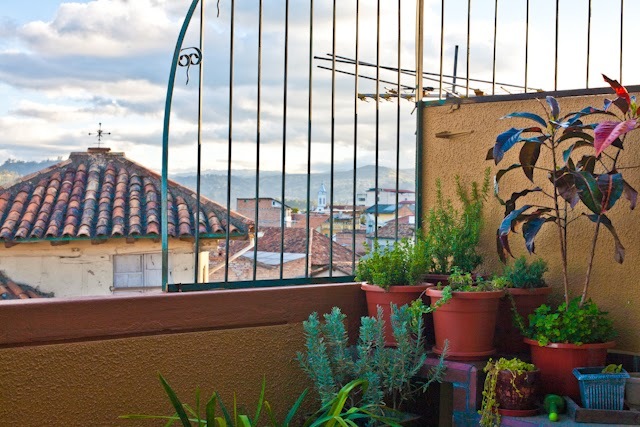 RENTING IN CUENCA - WE MOVED AGAIN to Apartment #6!!!!! One VIEW From our New Apartment Roof Top Terrace!! Has it really been almost two months since my last BLOG post?? 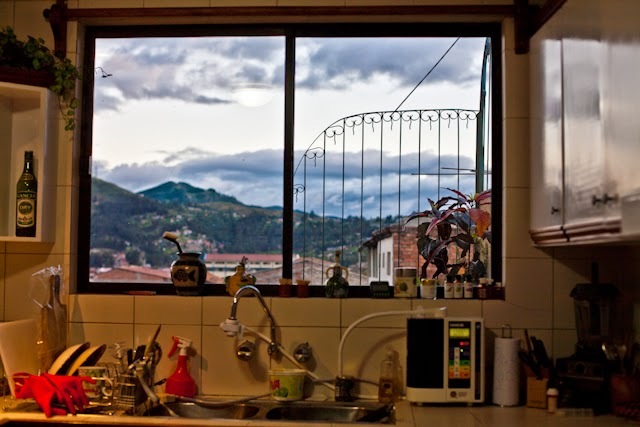 I was going to do a blog post of our Travel Adventure #2, and then #3 - but "Life in Cuenca" changed for us unexpectedly. It's those "Suddenlies" in life that we don't expect which cause everything we have planned to be on hold (like blogging or traveling) until we deal with what is in front of us. Our landlord of two years SUDDENLY decided to put some unacceptable restrictions on us as tenants - so we decided to up and move quickly!! Well, the last two months have not been an easy transition, in more ways than one - but we've made it through a most difficult move, some personal struggles, and unexpected health issues. 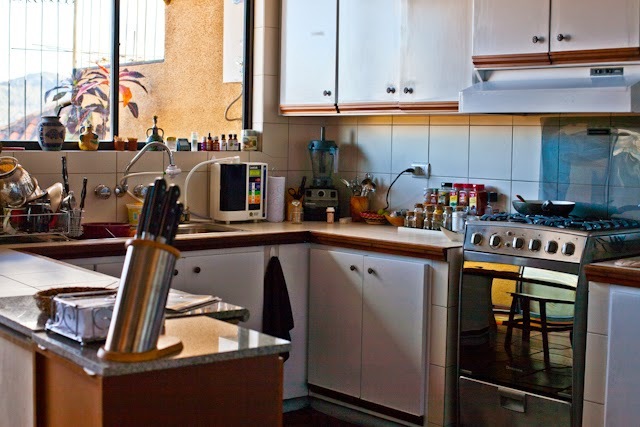 The same day our landlord confronted us with his ridiculous and unacceptable DEMANDS, a friend informed me that she had seen a beautiful apartment in El Centro with the added bonus of a large terrace and a spectacular view overlooking the city. It was becoming available in two weeks, which was perfect timing. I went with her to see it the very next day (one has to jump on these rare finds), had my absolutely necessary “WOW” experience, and then Bo accompanied me for visit #2. He, too, liked it!! Looking back at why we’ve moved so many times, I learned NOT to move again until that “WOW” encounter struck me. It was a difficult and exhausting two-day move, not to mention the two weeks of marathon packing - and moving again was not something I was ready for after moving from the States to Cuenca and returning three different times to purge and sell and give it away. How in the world did we accumulate so much STUFF in a little over two years here? Yet, as I look around at my beautiful Apartment #6, now all painted and decorated, every treasure has a place, and there really isn't that much in storage. I don’t go shopping anymore for STUFF since living here and settling in because we have everything we need - just the expenses for daily living. It took a month to get our new place completely repainted, scrubbed and cleaned, and everything we own unpacked and put away. Today, I love being home and enjoying the terrace and view. 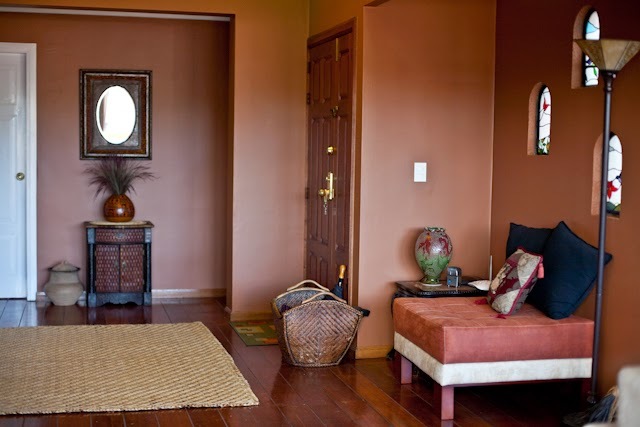 I love the earthy colors I chose for this place, and I love having THREE bathrooms - the master bathroom even has a jacuzzi tub! I love feeling like a princess again and having more room and a place to sit outside and enjoy all my plants. 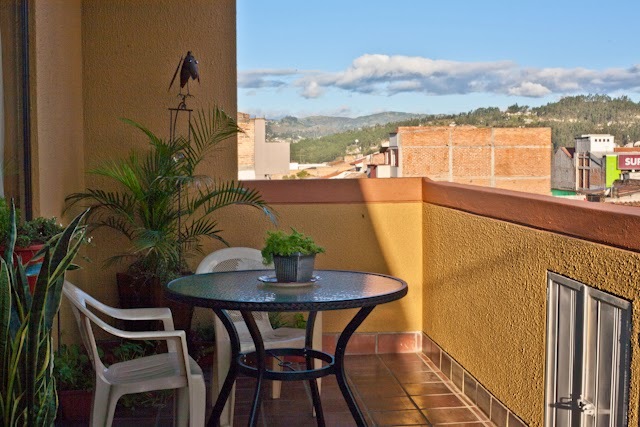 I mostly love my friend who thought about us when I put out the word to be looking for an El Centro apartment with a sitting terrace area. She knew it was a fit the moment she saw it. 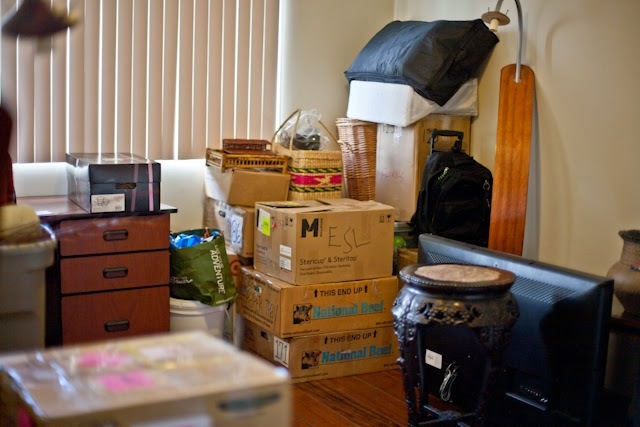 So, I wanted to post some photos of the transition and the end result - but I mostly wanted to update you on my point of view for finding a rental and the steps I once again took to make sure it was going to be the next "right" move. 1 - I believe that the best deals come when you can hear about a great place from someone else or see a sign as you walk around Cuenca. I was continually checking Craigslist, reading ads on Gringo Tree and Gringo Post, and looking at signs around El Centro for “Arrienda Departamento.” I went and looked at several since we knew we wanted to transition to a place with an outdoor sitting area. All of this before our landlord turned on us and caused us to "get out now!!" 2 - I firmly believe in negotiating the asking monthly rent. It’s worked for me every time. This apartment will be $120 more than our last one, but it is still in the price range we wanted to stay in and offers SO MUCH MORE. I knew it was renting for $400 to the previous tenant, so I was hoping for the same monthly rent. When I was told it would be $450 because the family hadn’t raised the rent in two years, I pleaded my case (that we could only afford $400 and we would be great long-term renters). We were thankful the family agreed to $400 so we could stay in our frugal budget. Yes, I'm so happy! We signed a 2-year lease to lock in that price. 3 - I still believe that having ones own furniture and decor truly makes it home - for me anyway. I have my specific taste for decorating and for art - and experiencing living in 4 different apartments the first 4 months of our Cuenca Living that were already furnished just didn’t cut it for me. 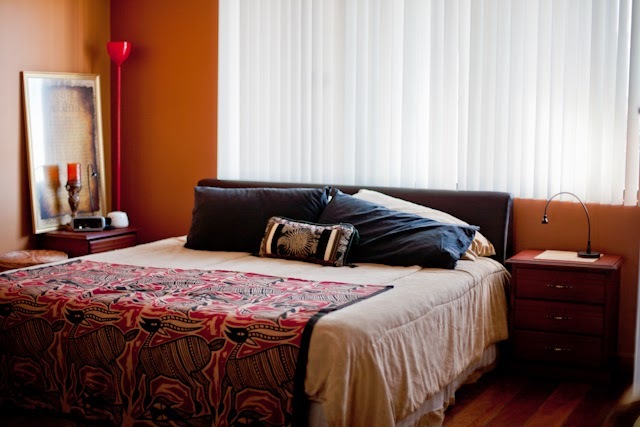 I think back at Apartment #4 where we were paying $500 for furnished. I’d rather invest in my own furniture and decor so I can call it home. It certainly doesn’t make a big move to an unfurnished place three flights up easy though, but for me it is worth it. 5 - Be clear on the contract you sign. Our contract was uncomplicated and clear without any hidden agenda or legal jargon. I love that we can paint and make changes to upgrade, and our landlady made sure that everything I needed fixed or changed once we moved in was taken care of and paid for. Just the beginning of our STUFF arriving to our new apartment. 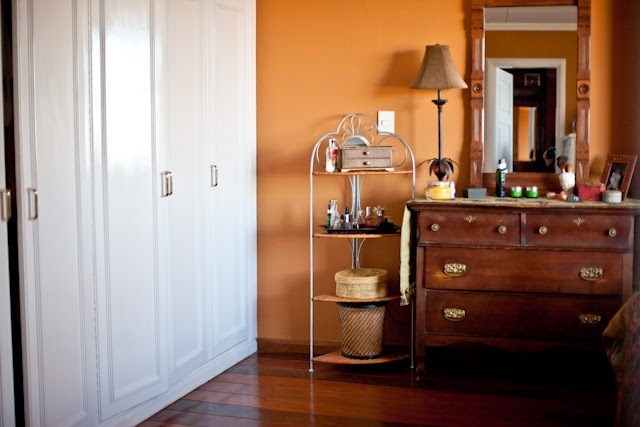 The entire place was originally painted a deep canary yellow - YUCK! 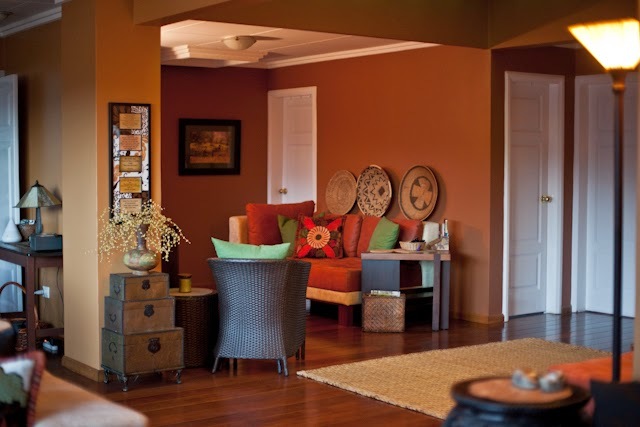 I was so excited to see it transformed with the earthy warm colors I chose. 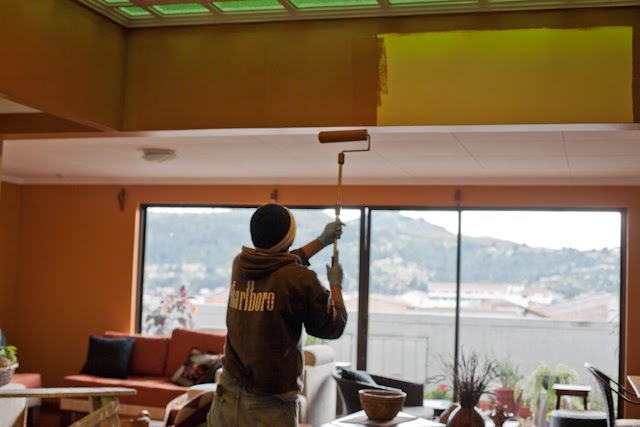 My painter, Henry, was the best - Maticulous, tidy, and always on time! It took days for the painting to end and a couple weeks for things to find its place. The colors were perfect and I was glad when the painting was finally done! I can't wait to hang our beautiful art around the apartment. For now, I just stuck photos where there were existing nails! 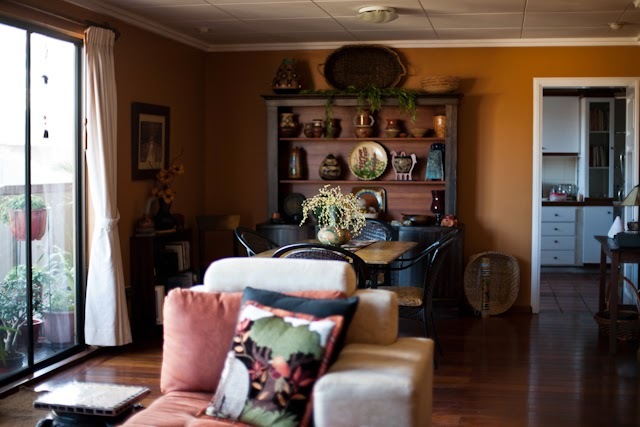 I stayed with two warm earthy contrasting colors throughout the entire apartment. That's our Cozy TV-Movie Cove. 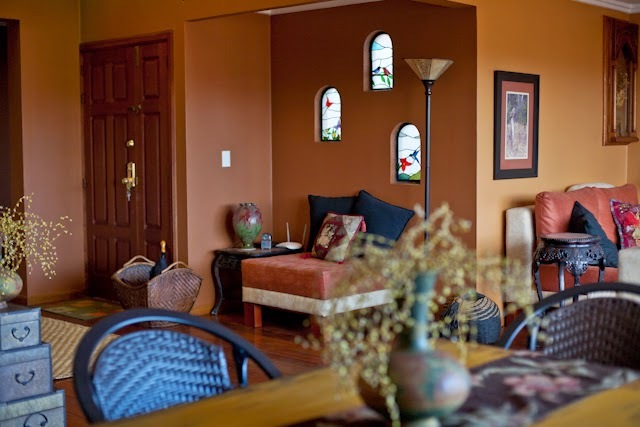 I chose the darker delicious mocha color for this area to contrast the lighter color in the dining-living area. To a golden mustardy color with a carmel-colored trim. Beautiful creamy linen curtains came with the apartment. I'll never close them because we have so much privacy here. We're the only apartment in the building, and we're up on the third floor. The Terrace is transformed - and I LOVE IT!!! 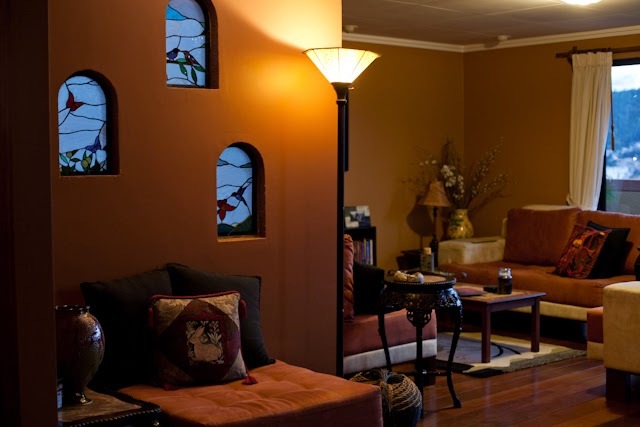 This apartment has such lovely added features, like the beautiful solid wood doors and floors, and those three sweet stained glass windows at the entrance area. A glimpse of the changing colors at dusk. We're enjoying the open spacious feel to this place. .....and the huge windows and bright light in this place. VIEW from our Kitchen Window!! 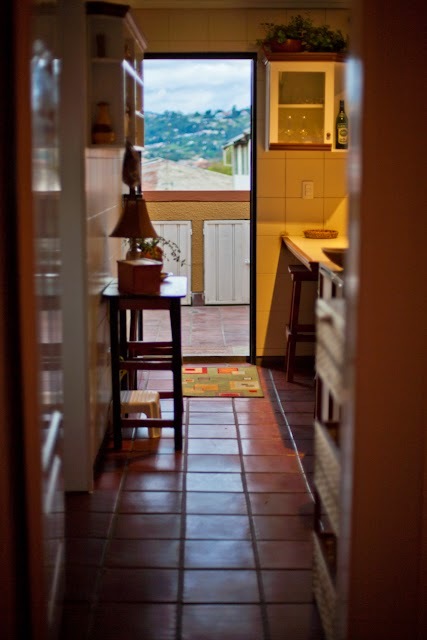 I love that we can enter the terrace from the kitchen area, and that we no longer have to suffer white tile in the kitchen. This one has beautiful reddish tiles. Oh, and we have a double sink, continual HOT water and great water pressure (brag, brag, brag). I've died and gone to heaven! 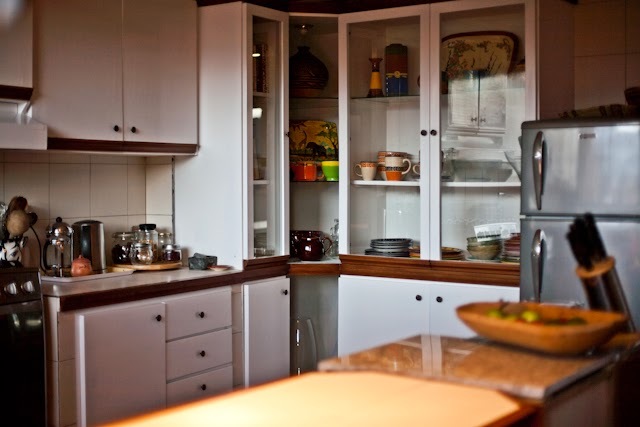 So much storage in this spacious kitchen too. Love showing my beautiful Vega dishes and Oregon Pottery. Tea, anyone? 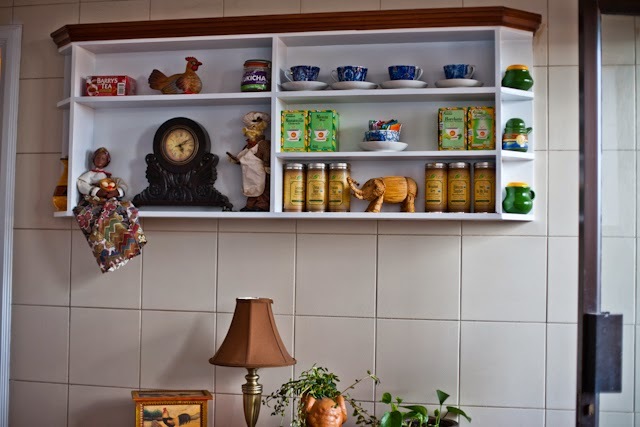 Every feature in this place is so charming!! The master bedroom is HUGE! I plan to replace all the white verticles with wooden shades. Every room has LOTS of closets and drawers for storage too - somthing the other apartment was so lacking. .....and we love to sit outside and enjoy them and the beautiful views. Love the red terra-cota tiles outside too! Who could ask for anything more when it comes to a $400 a month Historic District mini-penthouse???? I'm happy to be home AGAIN!!! I hope you enjoyed a beginning tour of what is yet to come (I'm still decorating!!!). For now, we are settled in and resting from two months of unexpected "Suddenlies." How many times have you moved since being here? 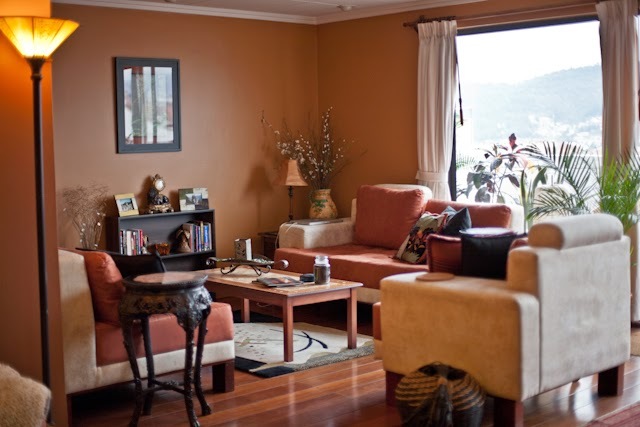 Do you love your apartment or home? Or are you just arriving or planning to come with the hope of finding that perfect place? It's there! 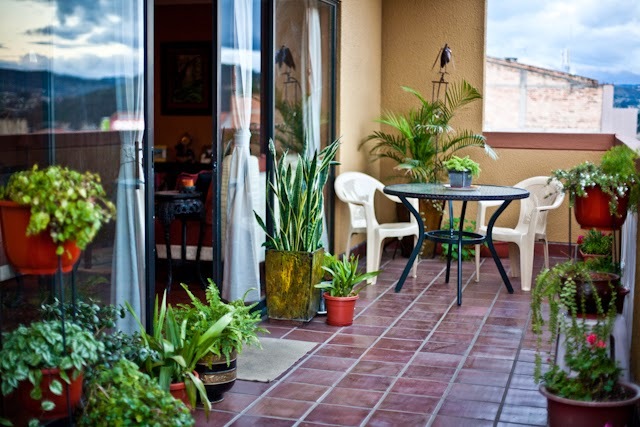 I promise...... Leave your comment and share your experience for our readers to get a glimpse of RENTING IN CUENCA. Didn't you have a good lease on your prior place? No, we never signed a lease for our prior place. It was a month to month for two years. So, we left not losing any money, and now, for the first time in 2.5 years here we have signed a lease for two years. We can still move out before that, but it would mean losing our security deposit - time will tell! Linda and Bo, I stand in awe of God's provisions for you. This is a lovely apartment, and I love your colors. As for the "stuff" you are not going to accumulate, I think most of us need to learn that lesson. God has continued to guide us and provide for us in the 2.5 years we have been here. 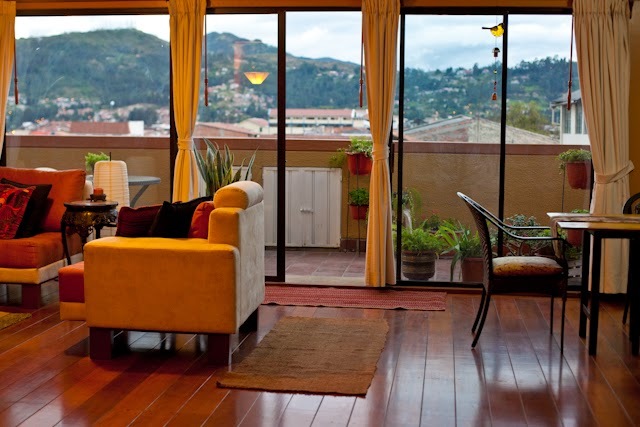 We LOVE our new place - and we continue to enjoy living in the Historic District of Cuenca. Life has truly been simplified since leaving Oregon and letting go - but we still have an abundance of STUFF and everything we need AND WANT living here. 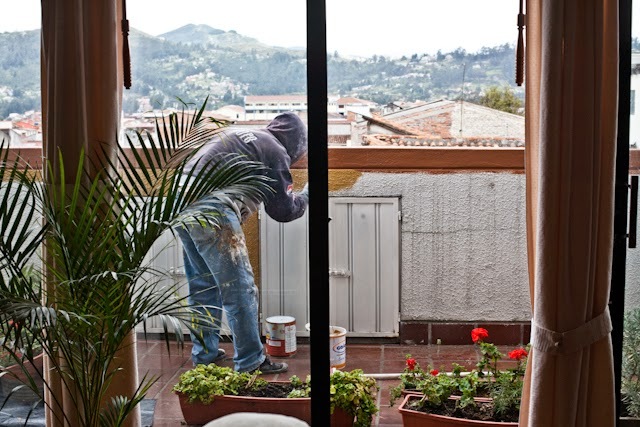 Hope you continue to enjoy our BLOG and reading about our continued adventure in CUENCA, ECUADOR. 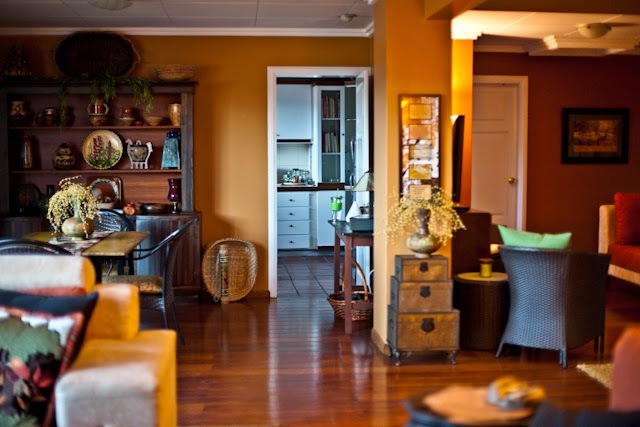 Love your new apartment; you are both creative and have such an eye for color! Since I have read your blog from the start and never miss your updates, I felt like I was with you, as you painted and redesigned your last beautiful apartment: I am sorry that it ended so abruptly. Life is in constant motion! Debbie (in Bend). Thank you for the compliment! 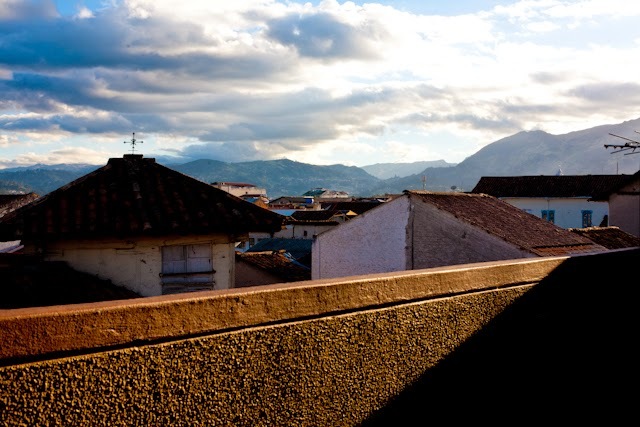 I'm so glad I can share our new apartment process with you, and that you continue to read our adventures in Cuenca. Yes, you are so right - LIFE is in constant motion and what seemed to end on an unexpected note in our last apartment drove us to transition to something so much better. It all works out in the end. Loving our new place. Keep on reading - more updates to come. I'm sure you are getting the most beautiful weather now in amazing Bend, Oregon. Suffice to say..... well done! The place looks amazing. We send our love and look forward to more adventures in your blog. So nice to hear from you and to know you continue to read about our Cuenca adventures. Yes, we absolutely love our new place - it was such a find and so perfect for what we had hoped for. I continue to decorate now that I've taken a long rest from that difficult move. We are loving our privacy here and having an outdoor area to sit and gaze upon this beautiful city. When are you coming to visit???? So nice to hear from you, and thank you for your encouraging words. 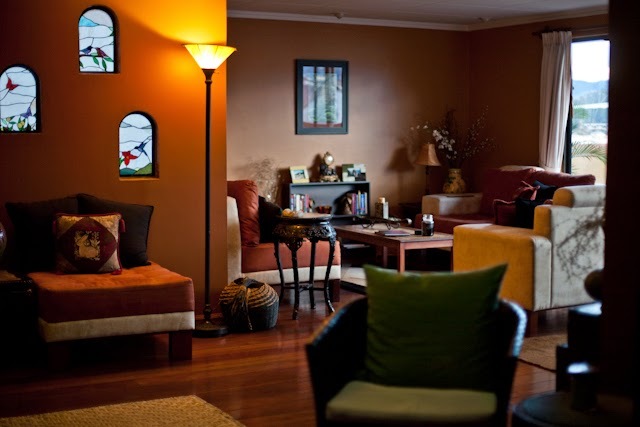 We are super happy too - to have found such a great apartment right in the heart of El Centro's Historic community. Loving our outdoor sitting space and having a place with 3 bathrooms too. I feel like a princess. Keep on reading and enjoying more of our Cuenca adventures. Congratulations on your new apt! Looks great! Just curious, what kind of restrictions did your landlord put on you? And why in the world would anyone want to risk losing the best tenants a landlord could possibly want? 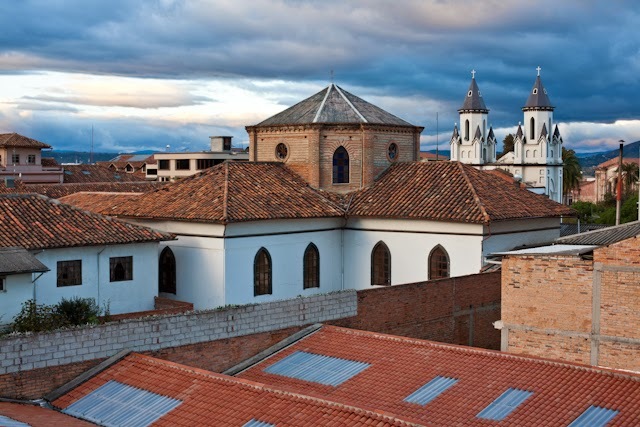 On another note, my dream of ever getting to Cuenca keeps slipping further and further away. Life is like that sometimes. Glad you like our new digs! I absolutely love this place and so does everyone who visits. It was a real find and I am blessed. Don't ever give up on your dream(s). That is when they don't come true. If Cuenca continues to call, then follow your heart(s) and go for it. You can always return if it doesn't work out. If you don't try it, you will never know. That's my two cents. Very nice blog ! bravo! So if you're interested ! ... Write us !! Welcome to my Blog, Yoan and Lila. You've been my inspiration and guiding light since I started to plan my move to Cuenca almost 2 years ago. I hope things are going well for you, and missed your posts for a while and worried about you. I am in my "temporary" home and have just found my dream apartment- "Wow"moment and all. I am preparing to move in the next month, and am wondering if you could give me the name or location of the huge furniture store you shopped in when renting your first unfurnished place. I won't need too much to start, but will need something of everything. 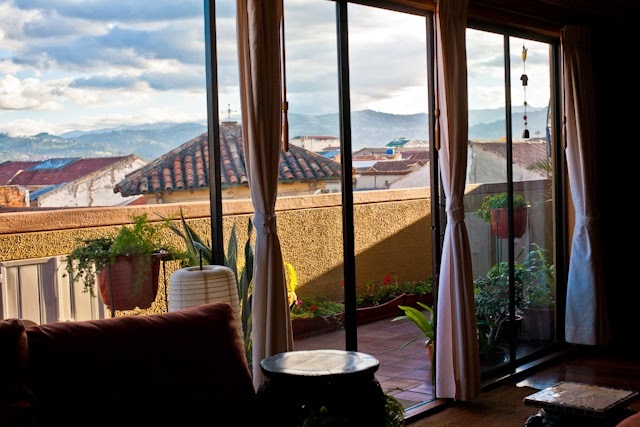 I am glad that you have found this BLOG a helpful read and inspiration for your planning process to move to Cuenca. WELCOME to this beautiful city that is now our new home! Congratulations on finding your "WOW" dream apartment too. How cool is that? The name of the furniture store is: Vera Vazquez Muebles on Esteves De Toral 10-46 y Gran Columbia. Hopefully, they are still there. 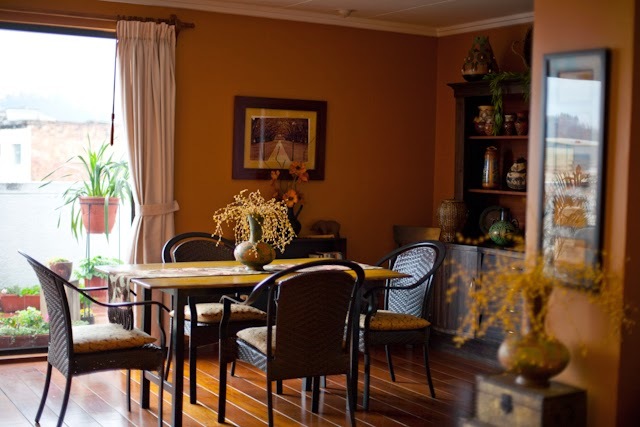 There are MANY amazing furniture stores around Cuenca, so shop first until you find that WOW place and service. I know prices have gone up since we purchased our "muebles" - but you are sure to find some good deals if you have patience. Also, check out GringoPost and GringoTree for deals from those leaving and returning to the states. I found lots of great deals like that as we started over. Keep it fun and best to you as you settle into your new home and city. I've collected some quality website links to other sites and blogs that I consider to be a helpful resource for my more than 11,000 subscribers. I would like to include your website in my list of resources. The format I plan to use to place your link on my site is in a rotating link list, categorized by topics (health, expat living, news, etc). This rotating widget will go on the right hand sidebar of my site. I would like us to do a link exchange; I place a link on my site to you and if you could also place a link on your site to me. If you agree to do this link exchange, please click on the link below where you can see the types of links and banners that we have. Hi, Bo and Linda! I am leaving my legal job in Houston to travel for a few years. I am coming to Cuenca very soon to live for two months as somewhat of a trial run for possibly living there long term in a few years. I'll be studying Spanish as well. 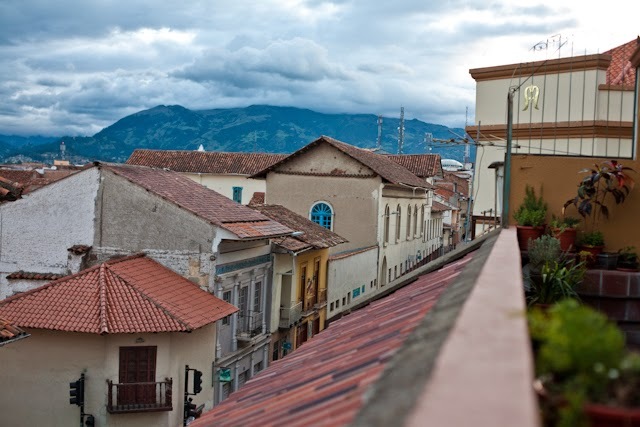 While I have read lots of blogs and sites about Ecuador, yours is the one I have enjoyed the most and the one most responsible for my excitement about getting to Cuenca. I would really, really be honored if you would allow me to buy you both dinner one evening at whatever place is your favorite in Cuenca! I get to town on February 14, 2016 and am free any evening after that. You can reach me at justspringer(at)gmail.com if you like and then we can make a plan. If you ever decide to move from your new apartment, let me know, please. I drool every time I see the pictures. HI there, just came across your blog re: Giron and wondering if this blog is still active, no posts for 2016. Apologies for contacting you through a comment, but I could find no other way to reach you. On behalf of the editorial team at Women Travel Latin America, I’m contacting you about our 2017 WTLA Writing Competition. We are now accepting submissions for the Alone Together anthology, which will be a book of travel writing by women and for women. We are passionate about empowering women to travel to Latin America. We want to see more women shake off any fears they may have, pack their bags, and explore new areas or revisit the ones that changed their lives in the past. We are looking for engaging, thought-provoking entries that explore the theme of women traveling in Latin America, whether alone or together. Share your stories with us; your unexpected triumphs, your moments of laughter or tears, the risks you took, the people you met, and the invisible barriers you broke along the way. Please join us in our goal of showing others that we can, indeed, travel alone - together. Find out how to enter the 2017 Women Travel Latin America writing competition on our website. It’s free to enter and the top prize winner will receive US$100. 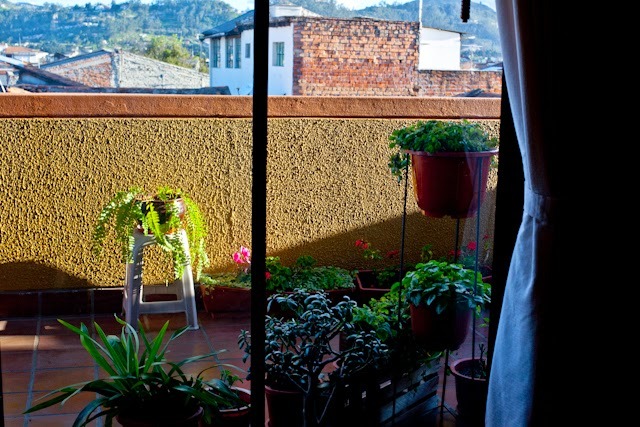 The 30 top entries will be included in the Alone Together anthology, published by the Bogotá International Press.